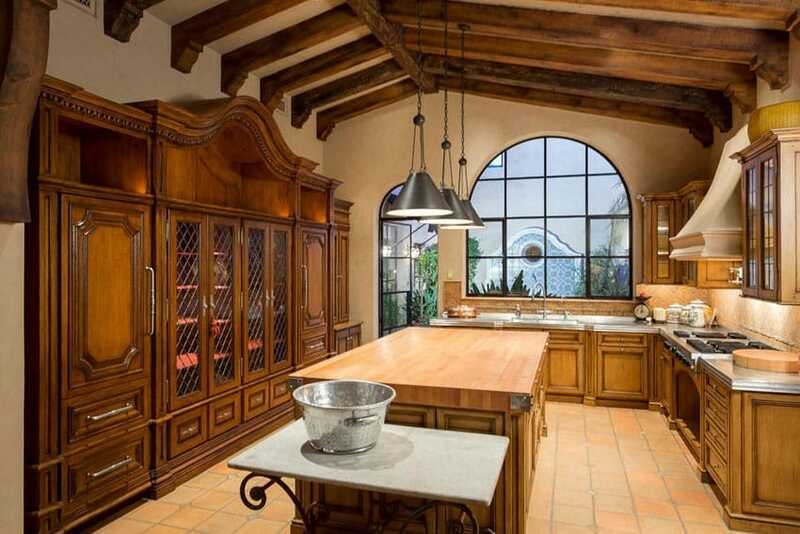 This gallery showcases beautiful Spanish style kitchens for design ideas and inspiration. The Spanish revival style house design offers a warm and welcoming atmosphere. Its theme can be created in the kitchen wherein the architectural and interior design is made following the inspiration of the Spanish colony details. 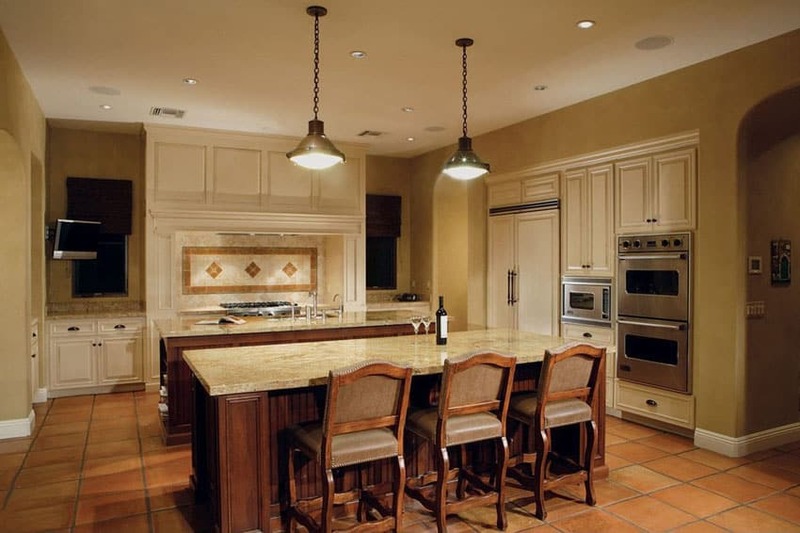 Below are popular design elements of a Spanish style kitchen. The kitchen in the picture above has authentic Spanish furniture pieces and details, giving it that nice antique appeal, while still blending in the more contemporary aesthetic of the interior. Floors uses a unique hexagonal-shaped terracotta tiles paired with plan white walls with rounded edges and corners. The kitchen are paneled, in light maple finish and topped with cream colored granite. In the middle of the kitchen is a large kitchen island with an antique wooden base in dark Mahogany finish, topped with light gray surface for a more modern look, and paired with 4 bar stools with turned legs and rush seats typical of Spanish furniture. 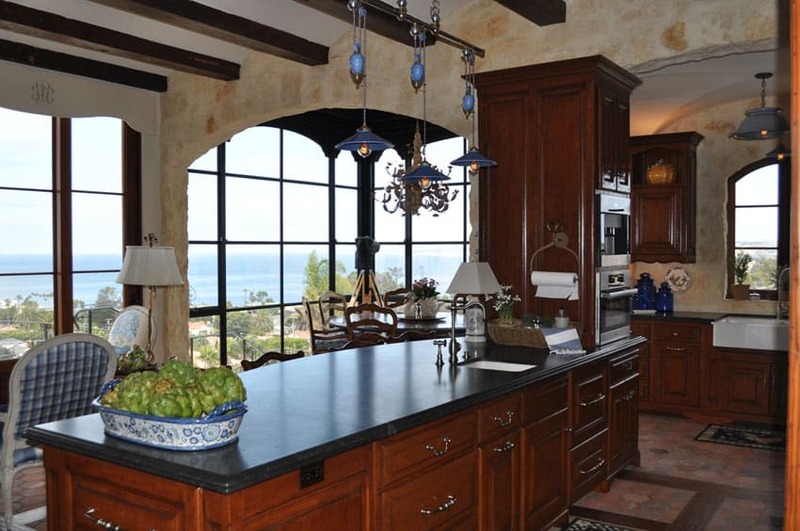 Known for their old world charm and architectural details, Spanish style kitchens are beautiful and inviting. 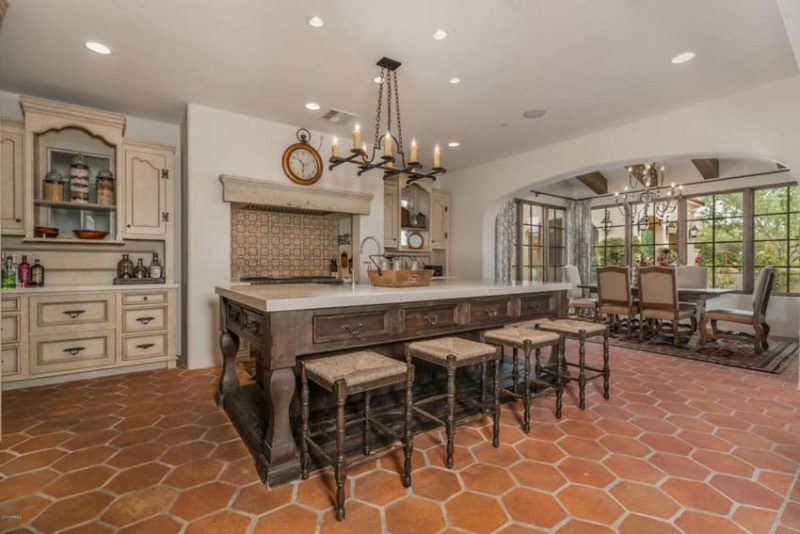 Sometimes referred to as Spanish revival kitchens, these spaces are filled with classic interior design elements , warm rich details, dark wood cabinets and painted tile work. 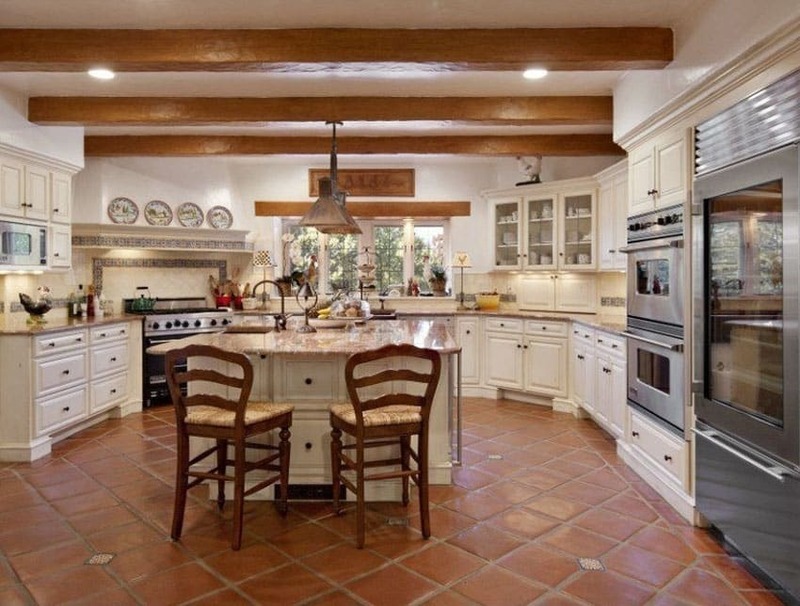 Here are some of the most important elements of a Spanish style kitchen. Flared hood – it is common in Spanish styles to have curves as seen in arches and scroll patterns and this idea is featured in the kitchen hoods which are being shaped in flares. Among the materials used in making these hoods include the cast stone, sheet rock, and corbels. Cabinets with ornamentation – this is to present an antique Spanish style with cabinets and furniture constructed mainly from walnut. Its decors include rope as well as beaded trim. There is wood on the hood that connects to the remainder of the cabinetry. 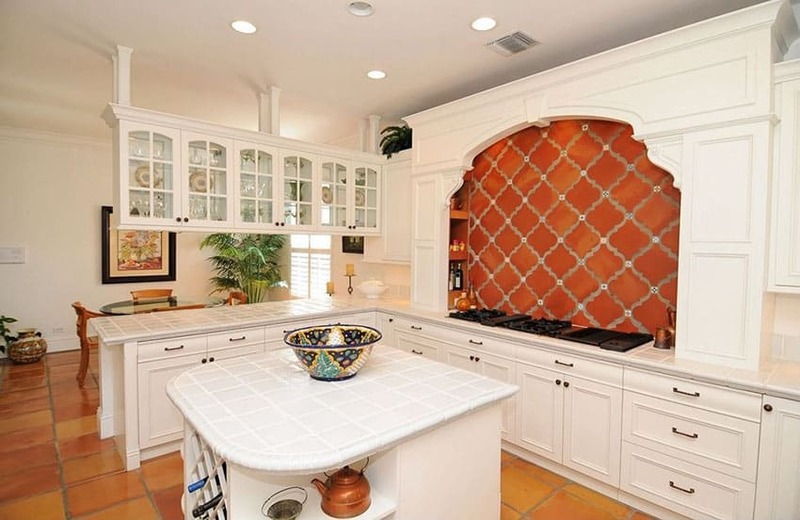 Hand-painted tiles – it features additional color and style to the backsplash. It is essential that the colors pair with the cabinetry. Oil-rubbed bronze finishing – it makes use of a dark brown color to have a vintage oil rubbed bronze appearance. It is utilized in the hardware and faucets to create a Spanish theme kitchen. Arched cooking alcove – a big cooking alcove makes a good design. It is important to make it large especially that the stove is the heart of any kitchen. Decorative arches – The Spanish interior design style is known for its dramatic arched windows and doorways that make a big impression. 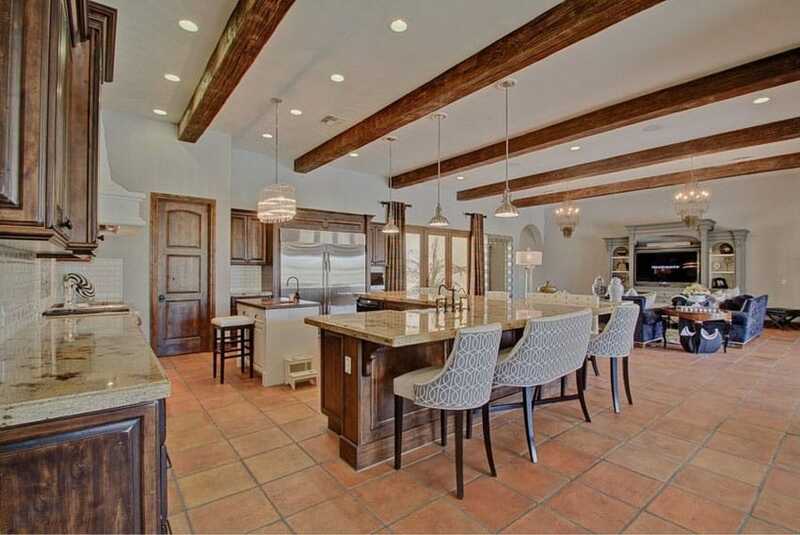 Exposed wood ceiling beams – it is common for wood beams to be seen in Spanish architectural design throughout the entire house. Wrought-iron work – in any counter or cabinet inserts, this wrought iron is used to have a Spanish influence in the kitchen space. Saltillo floor tiles – terracotta tiles are often used as they promote a warm atmosphere. 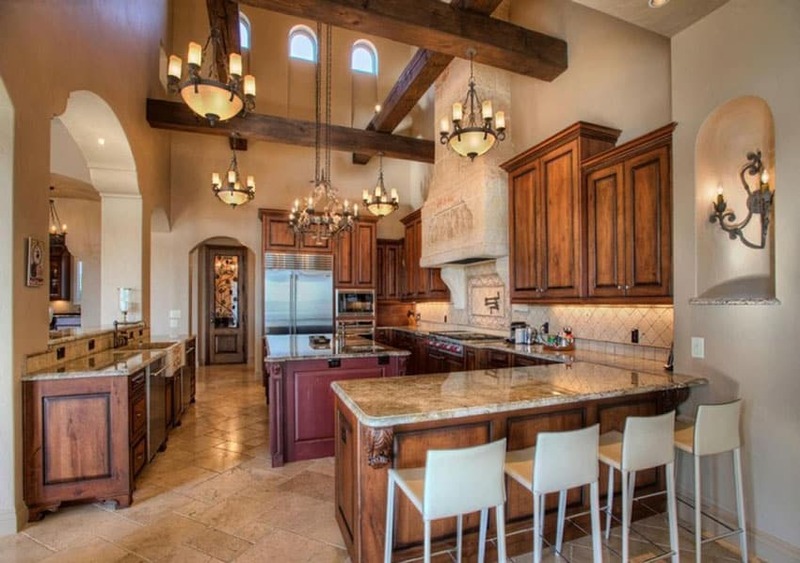 High ceilings and large arch openings gives this Spanish style kitchen a very authentic Spanish feel, with a more modern touch. 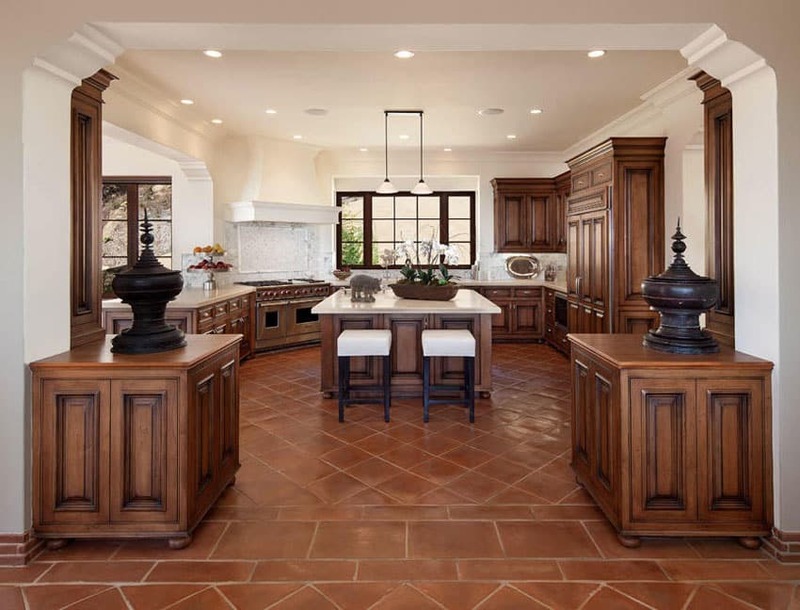 Floors are square terracotta tiles, while the walls are plain white to make the space look clean and bright. The kitchen uses solid Mahogany cabinets with gray counter top, while for the kitchen island, the base cabinets are in dark wengue, and the top is solid maple butcher’s block. The emerald green and blue Spanish tiles adds a unique and elegant pattern on the backsplash, adding a pop of color and movement with its elegant pattern. 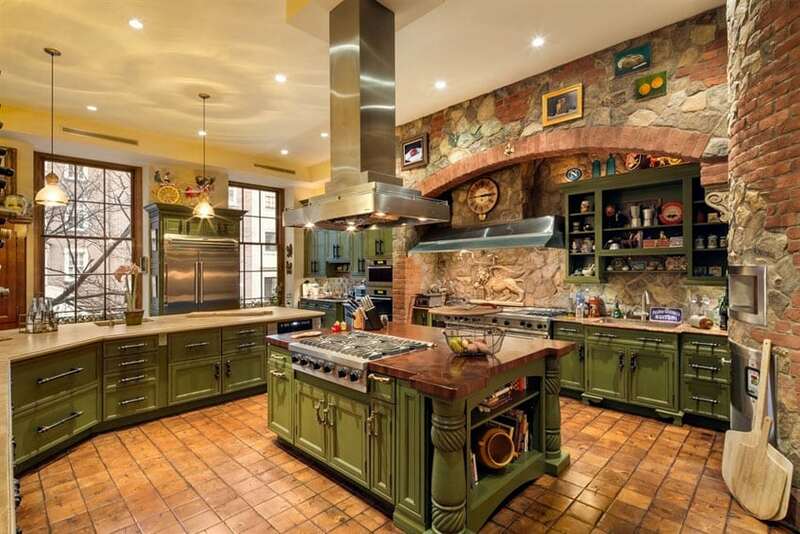 This Spanish-inspired kitchen space is actually a mixture of different styles. 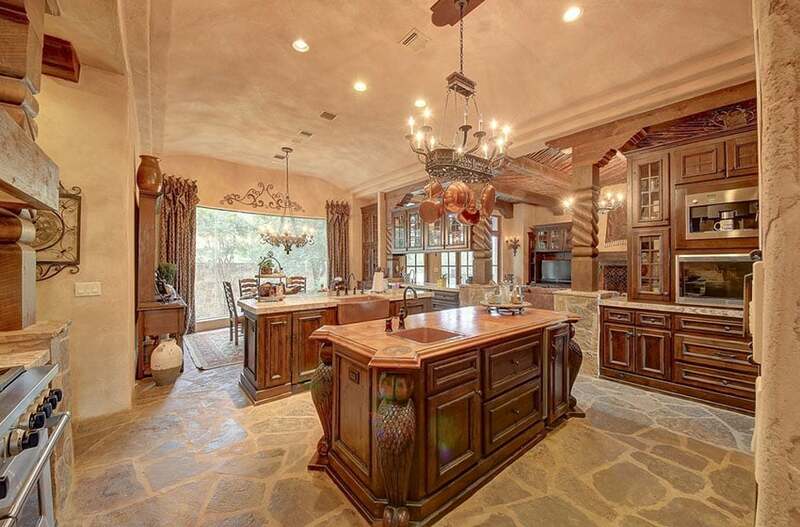 You will see Queen Anne chairs in the dining area, with matching dining table and bar stools at the kitchen island. 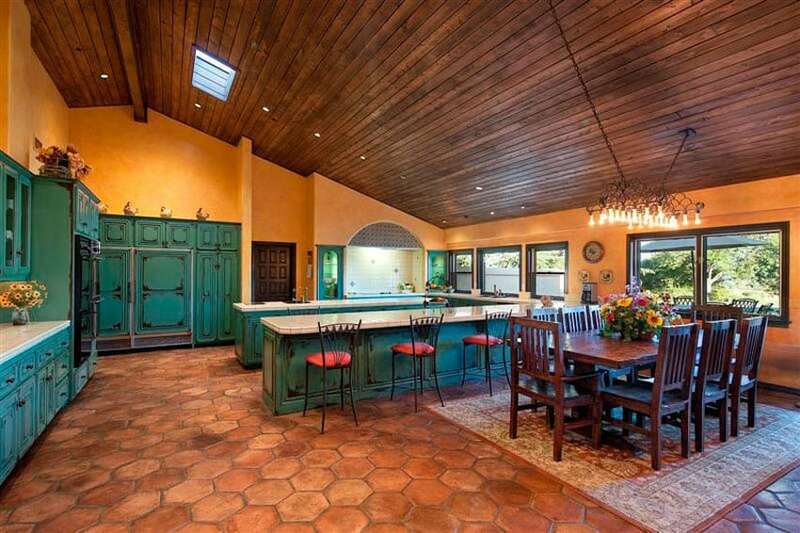 The kitchen itself has Spanish colors and motifs. Dark oak kitchen cabinets has turned wood motifs along the cornice details, and it also uses Spanish tiles for the backsplash in a mixture of orange, cream and green to blend in with the warm color scheme of the space. It also has a large kitchen island with ebony finish base and marble top. Hexagonal terracotta tiles, combined with orange walls and wood solid teak wood slats for the ceiling, gives this large kitchen area a warm ambiance. However, instead of applying a more traditional wood finish/stain on the kitchen cabinets, this one uses emerald green finish on its paneled wood cabinets and tops it with white granite. The cool tole of the green cabinets is a pleasing complement to the warm-colored walls, making it stand-out. Solid teak wood beams run along the plain white ceiling of this kitchen space, while square terracotta tiles are used for the flooring for that Spanish look. The paneled cabinets are all in white, with beige granite countertop for a bright and fresh look. There are also 2 Mahogany ladder-back barstools with rush seats, as well as accent Spanish tiles for the backsplash to complete the look. Natural stone floors and arched ceiling with limestone cladding give this space that authentic period-style appeal. The kitchen cabinets themselves also complete this look. using solid walnut with dark wood stain, emphasizing the grains and knots of the wood. Despite using traditional style cabinets, this kitchen still has a modern touch to it, as all its cabinets and drawers are handle-free, which means all of the use touch-to-open or push-to-open mechanisms. This kitchen demonstrates excellent cabinetry craftsmanship and finish with its elegant walnut cabinets with smooth matte finishing. It keeps a modern look with its minimalist color scheme, mainly made up of white, terracotta for the floors and the wood finish. Detailed panelings on the wooden cabinets really give this kitchen space an antique feel. The massive cupboard has intricate carvings and panel details, but given a modern twist with its cabinet lights. While the cupboard uses Mahogany finish, the kitchen cabinets uses stained beechwood with gray countertop, and butcher’s block for the kitchen island. It also uses subtly-colored Spanish tiles in cream and orange to match the color of the floors and walls. A rustic Spanish-inspired kitchen combining traditional Spanish elements and details to create this contemporary Spanish look. First off, terracotta tiles were used for the floors for that aged and rustic appeal, while walls are painted in off-white to make the rest of the colors stand-out. 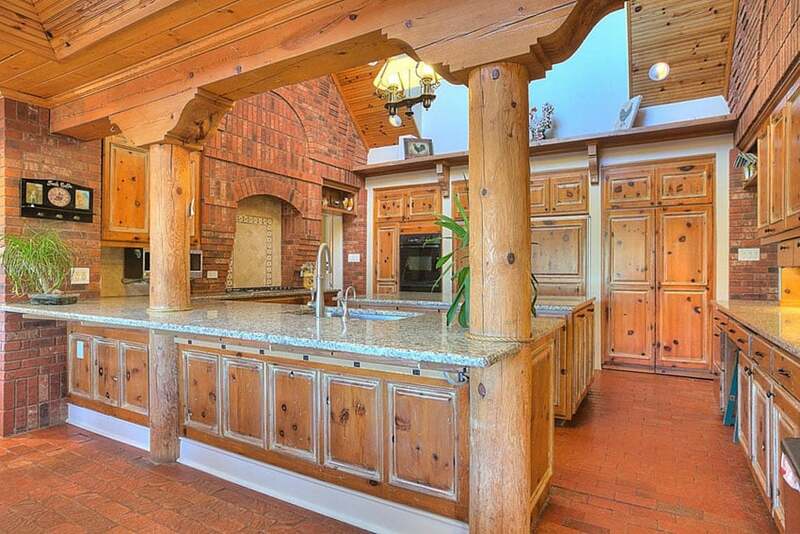 A massive round teak wood beam spans the ceiling of the kitchen, matching the finish and wood used on the kitchen cabinets themselves. Instead of stone counters, square ceramic tiles in a red terracotta color was used, which also runs along the length of the backsplash area and the range hood cover. The yellow-toned square ceramic tiles of the floor, light yellow walls and the masonry stone and brick cladding of the walls give this kitchen a soft warm glow and a nice rustic feel. The kitchen cabinets in this kitchen space are all made of solid wood, but are painted in a lovely shade of olive. Topped with cream-colored sandstone top, this kitchen definitely gives and rustic and antiqued look. A spacious and open-plan kitchen which uses traditional Spanish elements, combined with more contemporary pieces. The open layout makes for a bright a spacious feel to the kitchen, while it traditional oak-finish paneled cabinets adds that much-needed elegant touch to the space. Adding to the period-style feel of the space are the solid wood beams on the ceiling and the terracotta tiles used on the floors if the whole space. In contrast with the hard-edged wood an stone of the kitchen are soft upholstered seats for barstools, balancing the look and making it blend in with the style of the living area. Plain cream walls and ceiling gives this space a more refreshing contemporary appeal, while still maintaining its traditional Spanish aesthetics. 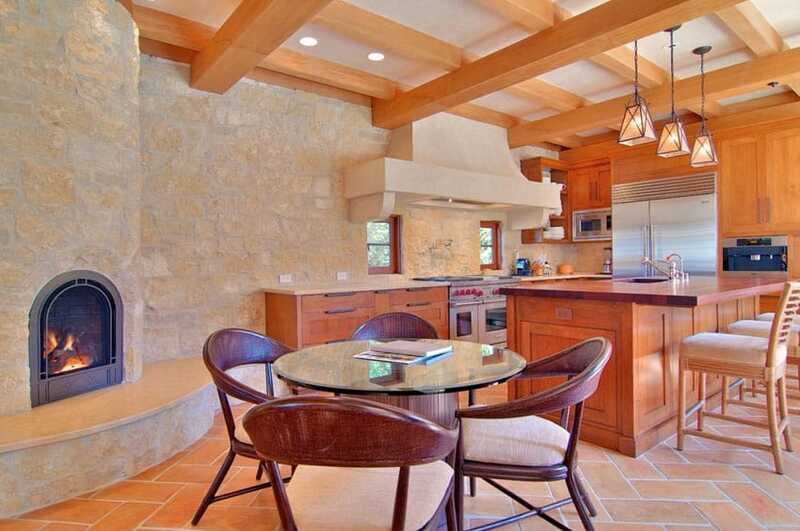 The kitchen is big and spacious, using solid walnut cabinets topped with cream-colored granite. 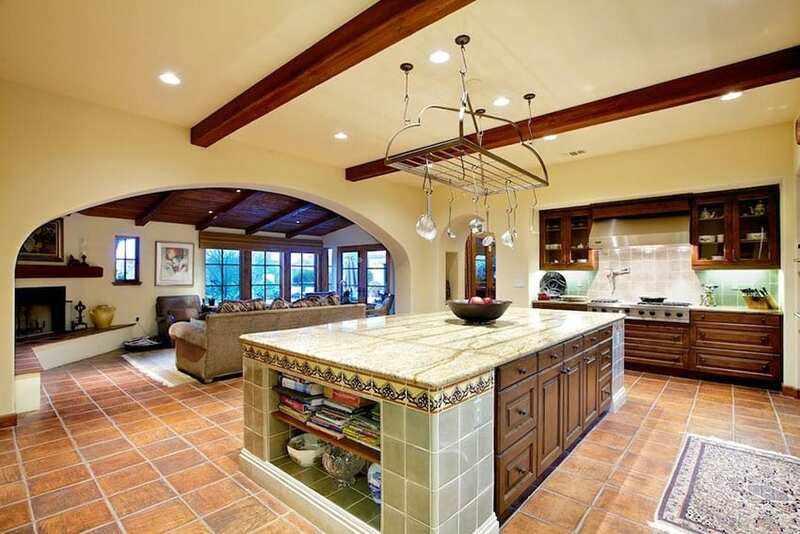 In the middle is a massive kitchen island, semi-fixed at the center with its concrete sides clad with sage green ceramic tiles and Spanish accent tiles. The solid wood beams on the ceiling and the overhead pot rack are simple touches, but enhances the antique feel of the space. Despite the fairly small space of this kitchen, it still looks spacious due to its high ceiling and windows, making the space well-illuminated. Walls has an oatmeal color which perfectly matches the stone floors, creating a soft and neutral background. Running across the ceiling are solid wood beams and chandeliers, setting a mysterious mood to the small space. while the solid walnut kitchen cabinets and beige granite demonstrates classic craftsmanship traditional Spanish kitchens. 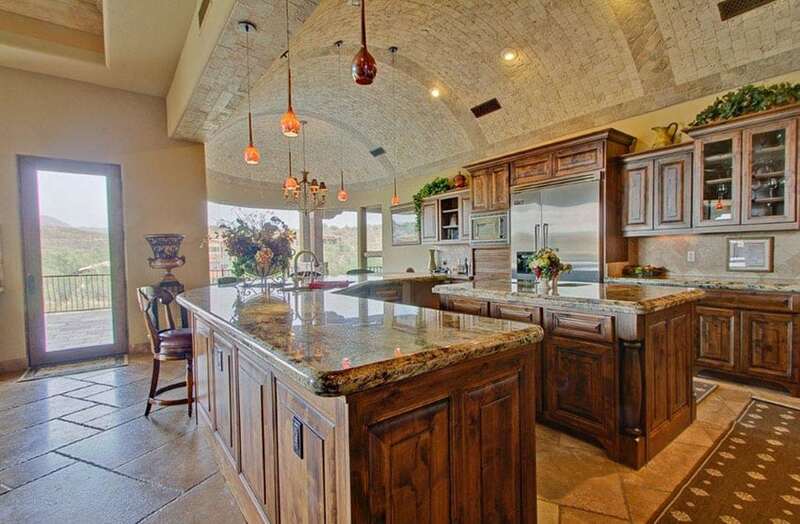 This kitchen is a contemporary interpretation of Spanish style kitchens. Instead of detailed panelings, this kitchen simple panel designs using teak wood. It also has beams running along its ceiling, but instead of using darker wood, it uses light maple wood, keeping to its bright and orange-tone color scheme. The floors also uses terracotta tiles, but are in a rectangular shape and in a chevron pattern for a more modern appeal. Small Spanish style kitchens such as this can use traditional-inspired kitchen cabinets painted and finished in white for a clean look. 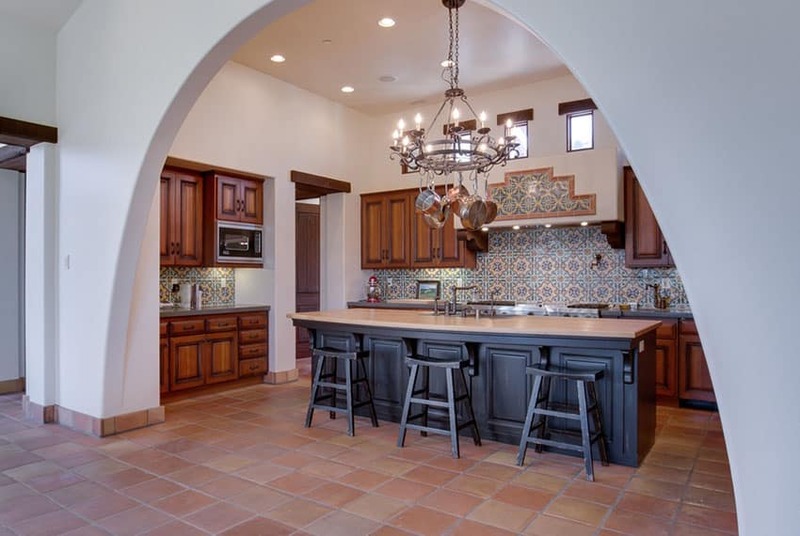 The interior has subtle Spanish influences seen in small details and finishes, such as the terracotta flooring, the white ceramic tiles used as countertop and the terracotta arabesque tiles used as the backsplash. The combination of colors and finishes in this kitchen really gives it a traditional feel, creating a warm over-all ambiance. The flooring are natural blocks of stone and paired with rag-rolled cream paint finish for the walls, giving it a sort of outdoor feel. For the kitchen, natural Mahogany wood was used for the cabinets, with intricate panel details, owl bust accents and turned posts, giving it a traditional Spanish look. This contemporary kitchen takes Spanish influences to create this look, creating a rustic yet modern feel to the space. It uses small blocks of hexagonal terracotta tiles for the floors and paired it with plan white walls. For the kitchen cabinets, dark walnut was the finish of choice, topped with dark brown polished granite. The dark wood kitchen cabinets were also paired with dark gray slate subway tiles for the backsplash, creating an even darker finish to the surface, contrasting with the plain white walls and ceiling. 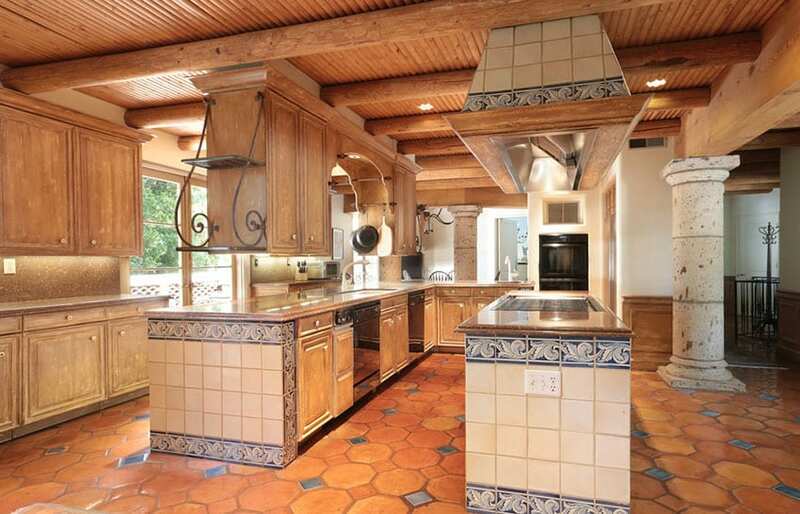 Terracotta floors and the wooden ceiling already gives-away the Spanish influence of this kitchen space. The kitchen cabinets matches the finish of its maple wood ceiling boards and beams to create a cohesive look and avoid too much variety of finishes. The side of the kitchen islands are supported by concrete clad with ceramic tiles with accent of blue Spanish tiles, adding a subtle detail to its surface. 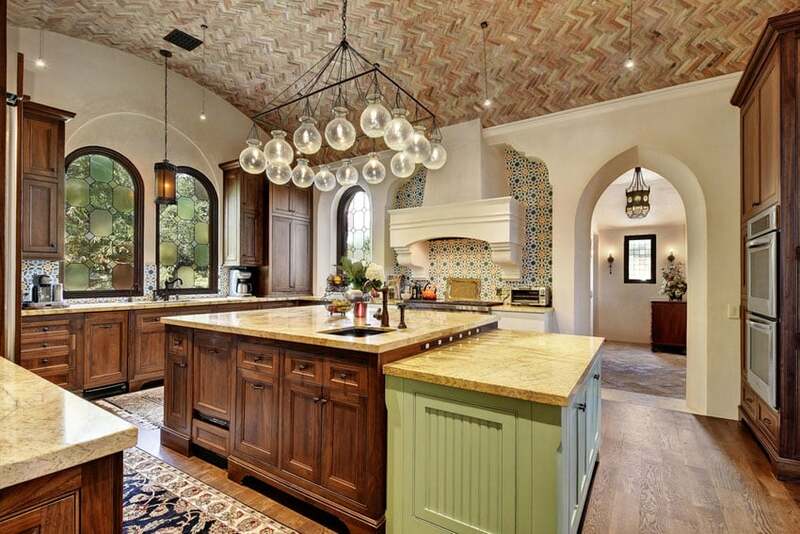 This kitchen has very unique architectural elements, like chevron pattern bricks on its arched ceiling, and stained glass for its arched windows. It also has pointed arches, showing its Moroccan influence. The kitchen cabinets has a clean and elegant finish, using natural walnut topped with cream-colored granite. It also uses Spanish tiles for the backsplash in blue, yellow and red, adding a welcomed pop of color and pattern to the surface. Above the kitchen island, is a modern chandelier using blown glass, adding a interesting accent light to the space. This modern interpretation of a Spanish style kitchen combines dark and warm colors to create this dark and mysterious ambiance to the space. Mustard-colored walls and terracotta ceramic floor tiles serves as the warm background of the space, while the kitchen cabinets is a combination of natural Mahogany finish and cream-painted finish. The bar counter has Spanish-style bar stools, upholstered in tan leather with nailhead accents. Brick floors and walls already give this large kitchen a very warm tone, but the orange tone of the teak wood cabinets, along its visible dark knots gives this kitchen space a very natural feel. To balance-out the orange tones, the walls were painted in white, and the countertop used is gray granite. Plants were also used to complement the orange tones of the kitchen and enhance its natural look. 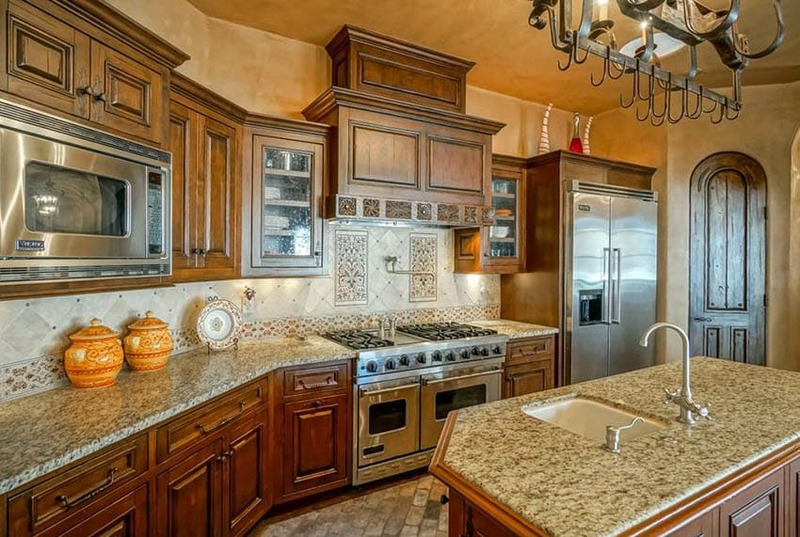 This gorgeous Spanish gourmet kitchen design is well equipped with Viking appliances, Brazilian granite countertops and decorative tile backsplash. Custom wood inset cabinets gives this space plenty of charm and rustic ambiance. 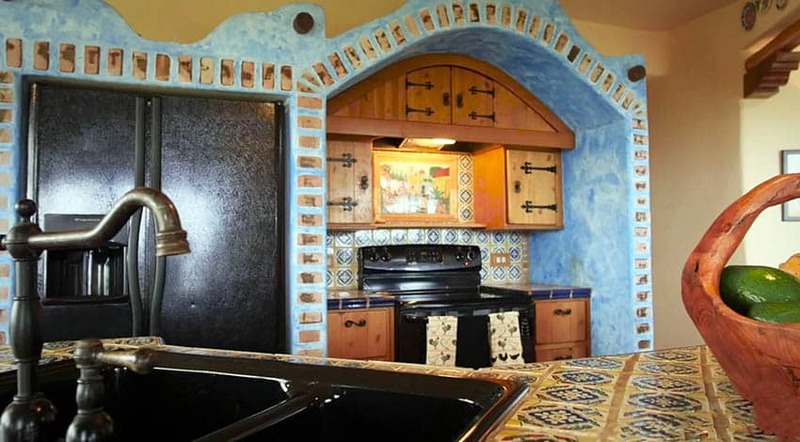 This very traditional Spanish style kitchen features Pueblo Revival Architecture with beautiful ceramic tile work of a multitude of designs and colors. 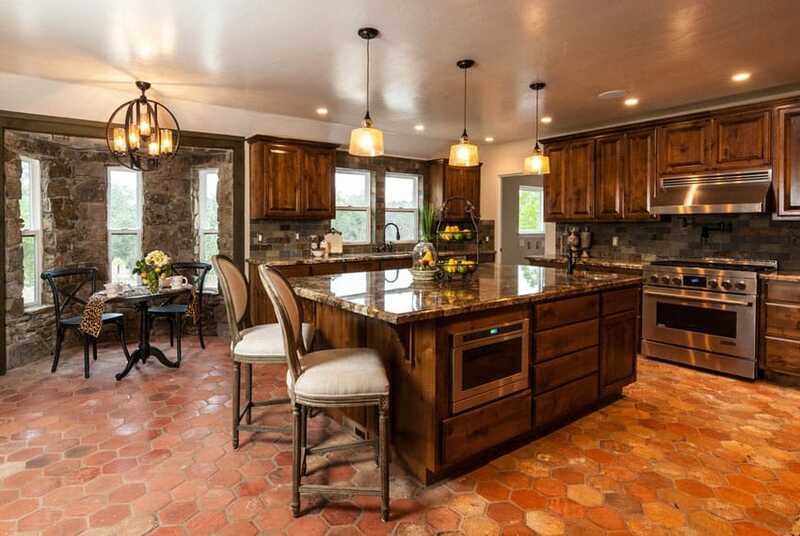 Dark terracotta floors combined with natural stone cladding on beams and columns gives this large kitchen a antique and rustic feel with its choice of colors and textures. 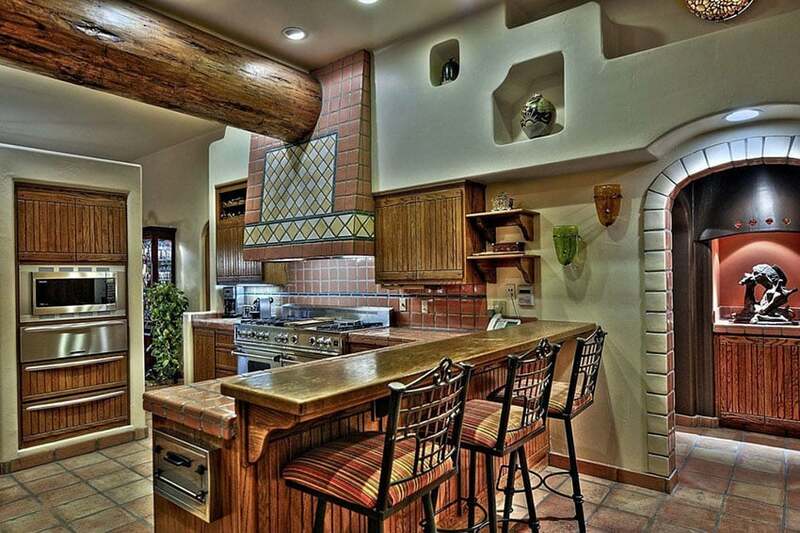 This is even enhanced with the weathered finish of the wood beams and the paint on the walls. The kitchen cabinets on the other hand, is a combination of natural fruitwood cabinets topped with white granite, and white antique finish topped with light gray granite. This finishes gives the space a natural weathered finish, making it look aged and adding more personality to the space. 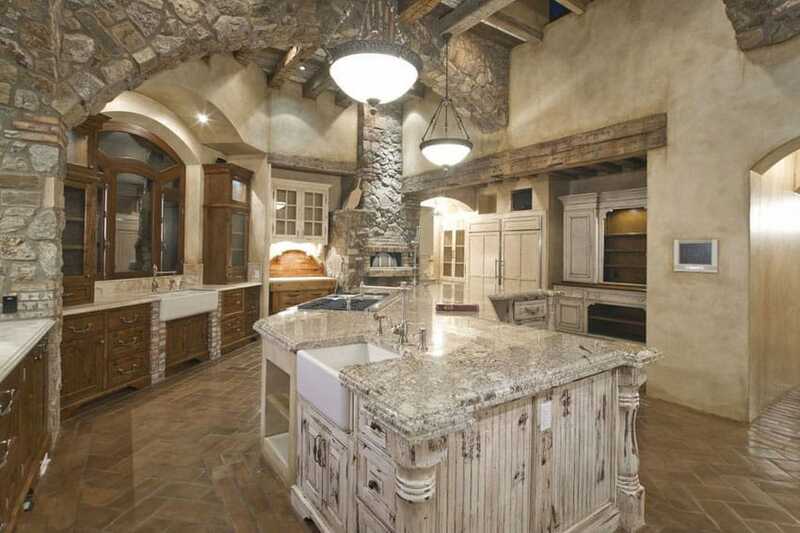 For more rustic designs check out our Mediterranean kitchens gallery here.